Praised for his singing tone quality and musical sensitivity, American saxophonist Wildy Zumwalt is recognized as a leading performer, teacher and scholar of the saxophone. He performs frequently throughout the U.S. and in Europe. Recent performances have included recitals at the Darmstadt Akademie für Tonkunst and the Goethe Institut in Freiburg, Germany. He is equally at home on the solo stage, in intimate chamber music settings, teaching young musicians, or researching historical archives. Zumwalt is a regular performer with the Chautauqua Symphony Orchestra, and has appeared with the Knoxville Symphony, Fort Wayne Philharmonic, Western New York Chamber Orchestra, Amarillo Symphony, Naples Philharmonic, Flagstaff Symphony, and Tallahassee Symphony. He has also been featured on numerous radio broadcasts including National Public Radio's Performance Today. 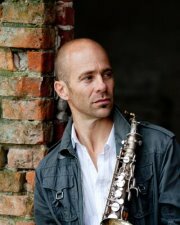 Zumwalt is an Associate Professor of Saxophone at The State University of New York at Fredonia, where he teaches applied saxophone and conducts the Fredonia Saxophone Ensemble. Prior to his teaching position at SUNY Fredonia, Zumwalt served on the faculty at Northern Arizona University in Flagstaff.